Alternative Medicine: Miracle story of Kamal Kaur - "SOHAM"
The 83-years-old woman, Kamal Kaur from a village in Meerut District has successfully under-gone drug-free Holistic Medicine therapy, for intolerable and uncontrollable Pain due to Severe Osteoporosis and suspected Cancer leading to Fracture in D-12 Vertebra of her Spine, at “SOHAM” The Clinic for Holistic MediCARE & CURE that specialises in curing people suffering from various incurable ail-ments with conventional drug based systems or surgery. This reporter met this lady last week having attended the therapy at Dr. Tuli’s New Friends Colony Clinic for the last three months. She was found to be bursting with boisterous energy in appre-ciation of the therapy that has re-lieved her pain, restored her full mobility, she has lost 10 kgm. of her body fat; she finds a pink visible on her cheeks as her haemoglobin has improved to 12.0 gms. She reported of not only normal life after being severely restricted for several years, but states to en-joy her health today better than in preceding ten years. Shri Jagdish Singh, the son of Smt. Kamal Kaur, a master’s de-gree holder from Meerut University and a garment exporter revealed that doctors in several big hospitals had attributed her ex-cess weight and muscle wasting to have completely damaged her back bone and knees, restricting her to a bed for the last several years. They advised that she ur-gently needed to go under Cancer surgery and demanded huge money for her treatment. But, when her condition deteriorated to a threatening level, the family decided to seek Holistic Medicine treatment with Dr. Tuli. 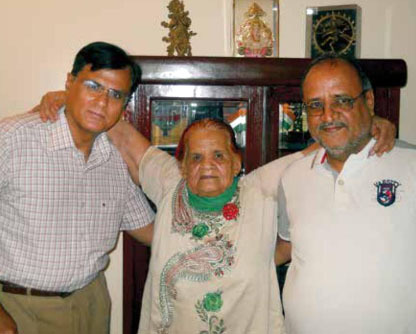 Jagdish Singh cursed himself for delaying his mother’s treat-ment by Dr. Tuli as he recalled that his family has patronised Dr. Tuli for over 25 years for his holistic therapy, and it has each time come to their rescue with 100% success rate whether it was for cure of Infertility of his wife, severe Bronchial Asthma of his father, Heart Disease, Oral Cancer, Hiatus HerniaGERD, LupusSLE with Sarcoidosis, Kid-ney Failure, Slip Disc-Sciatica, Arthritis of Knees needing total joint replacement, and a range of ailments amongst his family members and friends circle. As per his reputation with us, Dr Ravinder K. Tuli assured her that his therapy shall alleviate her pain and suffering in next few days and here she is in front of everyone proving magi-cal success of the all inclusive drug-free system of treatment. He stated that he didn’t reveal to him at that stage that the doctors suspected Cancer of the Spine. In retrospect, as the reports and clinical condition reveals that she has been absolutely cured of all her visible and non-visible ailments and the quality of her health at this stage speaks in her own words. Dr. Tuli explained that Holis-tic Medicine is the latest emerging speciality in the developed world and it’s a board certified speciality in the US for nearly the last 20 years. It complements the ‘science’ of evidence based mod-ern medicine with the ‘art’ of time honored and highly reproducible drug-free modalities of the various officially recognised alternate or traditional (AYUSH) systems of health to overcome inherent deficiencies of modern system of medicine to improve ‘quality of life’ and ‘add life to years’ of each individual. According to him this ‘synergy’ of all the systems of medicine, in fact, helps to eradicate the root cause of all kinds of sickness, initiate healing, effect true CURE, and restore positive health and total wellness in majority of patients.